Do you have a long sidebar that is breaking your WordPress layout on certain pages? Recently one of our users asked us for a solution. Since the user didn’t want to remove any of the widgets, we suggested adding a fixed height and scroll bar to to all long widgets which fixed the problem. In this article, we will show you how to add a custom scrollbar to any element in WordPress. 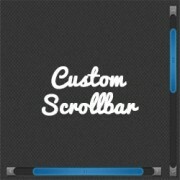 First thing you need to do is install and activate the Custom Scrollbar plugin. Upon activation simply go to Appearance » Scrollbars to configure the plugin. You need to start by providing a name for your scrollbar. The plugin allows you to add multiple scrollbars, so adding a name will help you find your custom scrollbar in the admin area. Next item in the settings is Target Element Selector. This is the class or ID of the web element that you want to target. 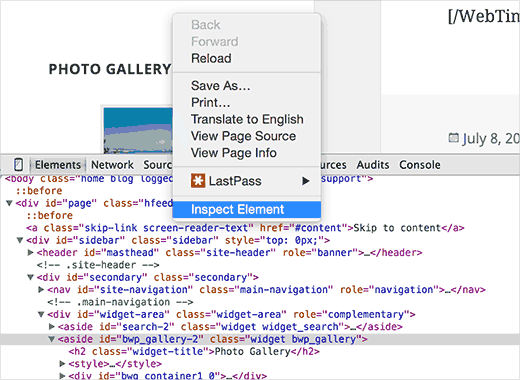 You can find the id or class of any element by right-clicking on the element in your Chrome browser and selecting inspect element from the menu. As you can see in the screenshot, the element we want to target is aside with the CSS class bwp_gallery. 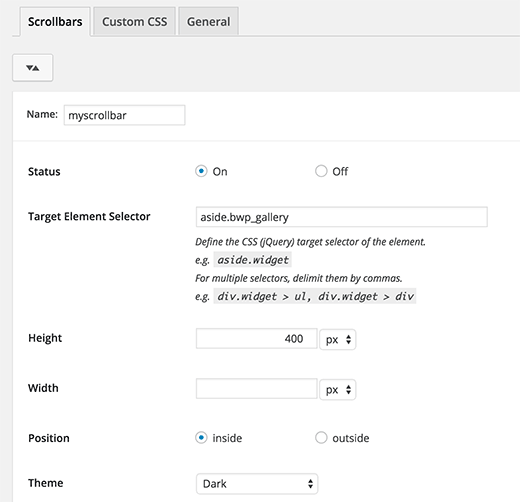 After entering the target selector, you can choose the height and width of the custom scrollbar area. You can also choose the position and a theme for the scrollbar. That’s all, you can now visit your website to see the custom scrollbar in action. You can repeat the process to create another custom scrollbar by clicking on the Add button. We hope this article helped you add custom scrollbars to any element on your WordPress site. You may also want to see our list of 25 most useful WordPress widgets for your site. i have a very long image that i would like to put a scroll bar on. 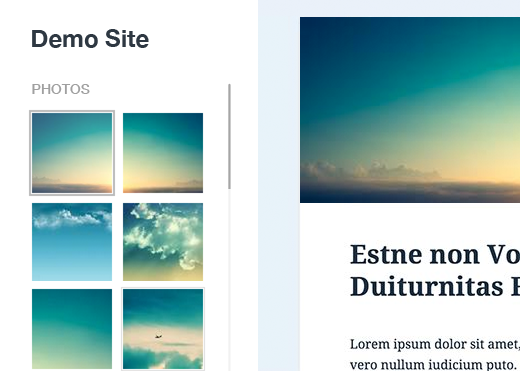 You would want to first reach out to Elementor as their page builder may be preventing the image from going beyond the size of the section you have set up. This is exactly my idea – to use it and make visitors spend more time on my site. My frontpage is such that I can combine several pages. So there is this particular page that is part of my front page, but it is long, so i want to use the scrolling to keep it short yet visitors can scroll just within it. My problem is that I dont know the Target Element ID. If you reach out to your theme’s support for the specific section you want they should be able to let you know the element they’re using. I want to add scrolling on a particular page – the page itself, not the sidebar or any widget. What will the Target ELement ID be? I right-clicked on the page body, but I dont know what to look out for. Can anybody advice? It would depend on the specific theme but normally for what you’re wanting it would be the content area. I am using the free version of raratheme’s lawyer landing page and I dount the developer can offer me such info as a free user. Sure, its the content area, and I wonder what the Element ID is called. Any ideas? Very nice and easy to custom widget. However, it took me a couple of hours to find what to enter in the Target Element Sector section while using Elementor. It finally worked with the following line: “.elementor-element-6daf57c”. The dot (“.”) at the beginning is important. This is working for desktop view, but I don’t want this scrollbar work on mobile devices. Because it’s ruin responsiveness. How can I do it to stop working on mobile devices? This tool is such a tremendous help to website appearance and functionality! You can select your featured items (pictures, posts, etc.) and put them almost anywhere … and several times, too! Your site visitor will spend more time on your site and interract with more content, etc. This is a total win/win! Thanks for sharing this plugin and more importantly how to set it up, I would never have thought to use the Chrome inspect element to find the target id without many hours of experimentation.